The start of this year saw the demise of Flight Line - in name at least. The magazine would in future be known as Microlight Flying, though the format for the content remained unchanged. This year's report on the Dawn to Dusk competition was written by Tony Smythe. In keeping with the spirit of a unified European market (1992 was a key year in European Union history) Tony took with him letters of goodwill signed by the BMAA CEO, Brian Cosgrove, and delivered them personally to the airport authorities in Midden Zeeland, Ostend and Calais. His total flight time was 9 h 20 min. Tony was presented with the Icarus trophy for the best solo flight by Queen Noor of Jordan. Three microlight pilots featured in the top ten for the competition in 1992, an event which attracted 40 entries with pilots from five countries. In Australia, some of the regulations for microlight pilots had been relaxed by this time. Originally, pilots were not allowed to fly higher than 300 ft. Now, the rule was a maximum 5000 ft AMSL, not below 500 ft, with no flying over built-up areas. 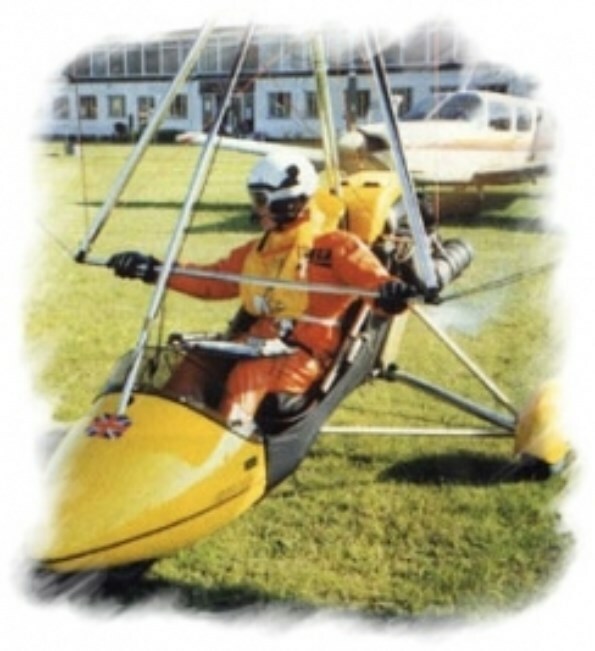 By 1992, Australian regulations allowed an all-up weight of 450 kg, allowing manufacturers to design aircraft which could not be registered as microlights in the UK. The Jabiru was a new design in 1992 and was well received, while the Australian designed Thruster enjoyed a good home market. The few flexwings flying in Australia included examples of the Pegasus Q. Most Australian machines had bigger engines than their UK equivalents. Dual ignition was commonplace and oil-injection was also popular. The CAA announced the end of the exemption scheme that had kept some of the old microlights flying after the introduction of airworthiness in 1984. Over 800 aircraft had initially been covered by the scheme, but after 8 years it had been decided that enough was enough. All aircraft had to be either type-approved, or type-accepted, a category for older machines which indicated that they complied with Section S as far as was practicable. Towards the end of 1992, a major debate took place in Microlight Flying with regard to the fees charged for microlight training. Instructors were criticised for over charging, and for linking training services to aircraft sales. Many instructors responded with their views on this aspect of the industry, as did other students who had been satisfied with the tuition they had received. According to the CAA there were 3241 microlights on the UK register in August 1992.The most popular model was the Pegasus XL. The Flash 2 Alpha came second. The most popular fixed-wing microlight was the Thruster TST Mk 1, though in much lower numbers than the XL and Flash. In Italy, there are around 10,000 microlight pilots by 1992. Angelo d'Arrigo was a successful international microlight pilot at this time, and flightline recounted his attempt at a world distance record. Angelo had won the microlighting World Cup in 1990 and had competed in the previous year's Round Britain Rally. His non-stop world distance record stood at 1020 miles, travelling from Italy to Egypt. 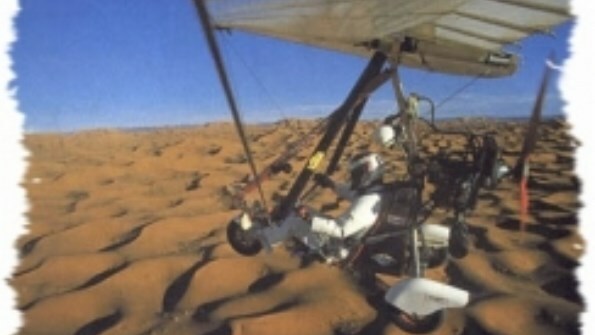 Image: Angelo d'Arrigo training for the record attempt over the Egyptian desert. Frenchman Guy Delage flew the South Atlantic in his flexwing microlight. This amazing journey involved staying awake for 26 hours. At one point the turbulence was so severe that his microlight was spun round by 180 degrees in seconds. A revolutionary navigational aid, the Ground Positioning System (GPS) is reviewed in Flight Line. Prices for these new instruments begin at £700, but it is thought that they will become more affordable as a wider range of manufacturers spot their potential. At the BMAA, there is talk of a merger with the PFA. It is thought that by combining the skills of these two organisations, a better service could be provided for all owners of little, light aeroplanes. Council considered a range of options, from an agreement to remain as two independent organisations but working more closely together, to full blown merger. While crossing the Channel had become almost routine by this time, the waters claimed their first British life in 1992. A group of 35 aircraft had set out to cross the Channel, flying in groups for safety reasons. However, Peter Keel, flying a Pegasus XL, suffered engine failure. Despite trying to attract the attentions of a nearby ship as he ditched into the sea, and the efforts of his team mates to gain the attention he needed, Peter was drowned before a rescue could be made. The AX3 side-by-side two-seater fixed-wing aircraft produced by Cyclone Airsports attained Section S. This machine has its roots in the American Weedhopper, designed in the early days of microlighting. The World Championships this year took place in Spain. They were reported as the toughest international competiton to date. While Britain's traditional rival, the French, flew as well as ever and netted the team bronze, the Spanish and Italians were also keen competitors. The big surprise was the South African team, which came from nowhere to within a few hundred points of toppling the British from their top place. Winning the team prize meant that Britain had been undefeated since 1988 in both World and European championships. The AGM this year was dominated by the possibility of merging with the PFA. For once, the focus was on the meeting rather than the exhibition, and a record number of people packed into the conference room to take part in the debate. The mood of the meeting was not anti-PFA, but it was certainly anti-merger. Subsequently, a reader-poll conducted by Microlight Flying confirmed the views of the meeting. As for the show, at Mainair, the big news for the coming year was the option of electric start on all models. While this was of interest, it reflected the fact that the industry was still finding times hard and no manufacturers had much new to offer. The Air Creation stand attracted the largest crowds. This French firm was planning to offer its Fun GT 447 for the UK market. On the fixed-wing front, the key contender was the AX3, which had just attained Section S. Two examples had recently flown from England to Spain.